How the Spurs big man scores points without making shots. The Spurs’ offensive rating is 14.6 points higher with LaMarcus Aldridge on the floor. (That’s the second highest of the team’s rotation players, just behind DeMar DeRozan’s 15.5.) And it’s despite Aldridge shooting only 44.3% so far this year, which would be a career low. He’s averaging career highs in offensive rebounds (4.3 per game) and assists (3.1 per game), but putting up “just” 20 points per game on 18 shots, with a handful of second chances and some dimes, doesn’t seem like enough to have close to the same impact as DeMar’s 28/7/6. Which means LMA has found ways to impact the bottom line that aren’t showing up in the box score. The Spurs do just about everything better with him on the floor. Despite Aldridge’s poor shooting so far this year, both the team’s eFG% and TS% get better when he’s on the court. Those numbers are startling for someone who’s carrying an individual eFG% of 44.3 and TS% of 50.3. Digging deeper into the numbers, there are a few things that help explain his impact. Aldridge is tied for 8th in the league in screen assists at 3.9 per game. That’s the number of times one of his screens leads directly to the player he sets a screen for making a field goal. 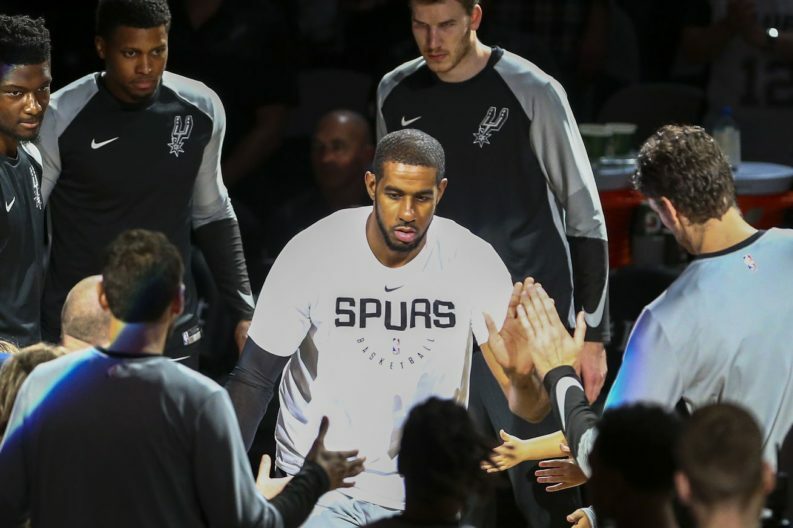 He sets solid screens, a lot of them, and rarely crosses the line into offensive foul territory, giving the Spurs ball-handlers maximum opportunity to find an open shot. While his individual offensive rebounding numbers are okay, the team’s numbers are very good when he’s on the floor. He’s 30th in the league in offensive rebound percentage, grabbing 12.0% of available offensive rebounds, but the team pulls down 28.9% when he’s on the floor, which is good for 10th in the league. When he’s off the floor, the team only gets to 25.7% of available offensive rebounds, which would be 25th. Much of that has to do with Aldridge taking the other team’s best rebounder out of the equation. He’s 2nd in the league in box outs, with 12.3 per game. His impact also shows up in some surprising places. The team’s assist to turnover ratio, for instance, increases from 1.65 to 2.19 when he plays. Most of that is an increase in assists – the team’s assists per 100 possessions jumps up from 19.4 to 25.0. But they also turn the ball over less, dropping from 11.7 turnovers per 100 possessions to 11.4, which is part of the reason the Spurs are 2nd in the league in turnovers. Going beyond the stats, it’s easy to see how LMA sets the table for other players with his hustle and court awareness. Having your 6’11” 260 lb. All-NBA player beat everyone down the court makes life hard on the defense. In the first clip, Kyle Kuzma tries to keep Aldridge from establishing deep position, and end ups flailing out of bounds trying to draw a ticky-tack offensive foul. That forces LeBron James to pick Aldridge up, leaving Rudy Gay, who has been scorching the earth so far this year, with an open three. In the second, the whole defense is so focused on Dante Cunningham with the ball and Aldridge in the paint, that nobody notices the wide-open shooter on the opposite wing until the ball’s half-way across the court. Josh Hart is actually running towards Aldridge until Dante Cunningham kicks the ball up to DeRozan on the wing, but watch Bryn Forbes in the top left of the screen. That’s pretty close to the most open you can possibly be on a basketball court. Is Aldridge fouling Johnathan Williams here? Probably. Does he make room for DeRozan to get the bucket? Definitely. DeAndre Jordan is so concerned about LaMarcus Aldridge that he doesn’t even contest DeRozan’s layup. This was a 1 point game with 45 seconds left in overtime, and Jordan just let him have it. This is one of the aforementioned screen assists. DmDr still has to knock down the shot, but Aldridge’s screen ensures he gets as good a look as possible. These are the little things that provide value in ways that are difficult to capture outside the final score. Plus/minus numbers and advanced metrics can help, but not all of them seem to recognize his impact. So far this year, LMA’s Offensive Box Plus Minus is actually a –0.7, and his VORP is 0.1. He’s been worth 0.4 Offensive Win Shares, which is about half of where he was at this point last year. Offensive Player Impact Plus Minus has him at +1.18, which is 27th in the league, but even that doesn’t fully explain how much better the Spurs offense is with Aldridge on the floor. That he’s such a net positive, even when he isn’t shooting well, is a great sign for this year’s Spurs, even if it’s difficult to put a precise measurement on it. Still, it’s more important to understand why LaMarcus Aldridge has so much impact than to determine exactly how to value his contributions. Some people would call it “doing the dirty work.” Others would say it’s buying into team basketball, or the Spurs way. Whatever you call it, Aldridge helps win basketball games, whether his shot is falling or not.